Here's another one adapted from the Le Pain Quotidien Cookbook. Curried cauliflower is scrumptious and I reckon I will be tossing it in my salads and various other creations. Homemade chili oil takes about 3 minutes and is delicious on nearly anything. Chili oil was not mentioned in the recipe, but this super sleuth detected in the accompanying photo, so I whipped some up - it made this little tartine shine brightly. Make Curried Cauliflower: Preheat oven to 425 F. In a bowl, toss cauliflower with spices and olive oil. Transfer to baking dish or sheet and roast until lightly brown on top, approximately 10 minutes. Make Chili Oil: In a pan, heat oil over medium low, add desired amount of chilies and cook for approximately 3-5 minutes. Remove from heat and pour into jar or bottle. I added one whole fresh red chili, chopped thinly and got a great amount of heat. I left the chili slices in the oil, but you may prefer to strain them out. 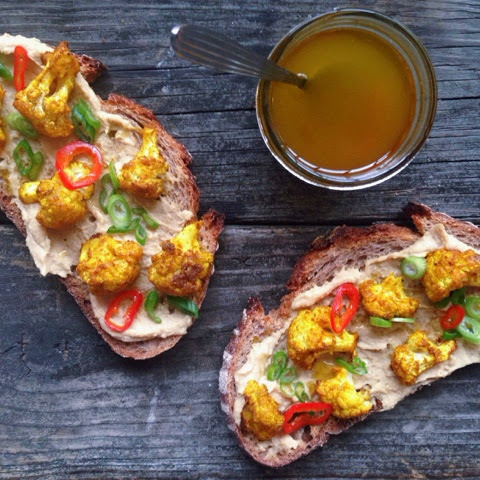 To serve: Spread hummus on bread and top with curried cauliflower. Sprinkle scallions on top and drizzle with chili oil.